Duisburg (German pronunciation: ) is a German city in the western part of the Ruhr Area (Ruhrgebiet) in North Rhine-Westphalia. It is an independent metropolitan borough within Regierungsbezirk Düsseldorf. With the world's biggest inland harbor and its proximity to Düsseldorf International Airport, Duisburg has become an important venue for commerce and steel production. Today's city is a result of numerous incorporations of surrounding towns and smaller cities. It is the fifteenth-largest city in Germany and the fifth-largest city in North Rhine-Westphalia with 488,218 residents at the end of 2010. The city is renowned for its steel industry. The last remaining coal mine closed down in the summer of 2009, but Duisburg has never been a coal-mining center to the same extent as other places in the Ruhr region. 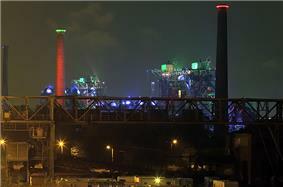 All blast furnaces in the Ruhr are now located in Duisburg. In 2000 49% of all hot metal and 34.4% of all pig iron in Germany was produced here. It also has a large brewery, the König Brauerei, located in Duisburg-Beeck, which makes the König Pilsener brand. The University of Duisburg-Essen, with 39,000 students, ranks among the 10 largest German universities. Duisburg is located in the Lowland Rhine area at the confluence of the Rhine and Ruhr and near the outskirts of the Bergisches Land. The city spreads along both sides of these rivers. Coat of arms of Duisburg at the town hall in Duisburg. A legend recorded by Johannes Aventinus (fl. 1525) holds that Duisburg, (along with Deutz, Cologne, Duisdorf in Bonn, and Doesburg in the Netherlands, all on the Rhine's right bank) was built by the namesake Tuisto, mythical progenitor of Germans, ca. 2395 BC. There is nothing to establish any historical basis for such an early founding of Duisburg, which would make it among the earliest cities in Europe. Latest archaeological studies show that the present-day market-place was already in use in the first century. It has been the major central trading place of the city since the 5th century. 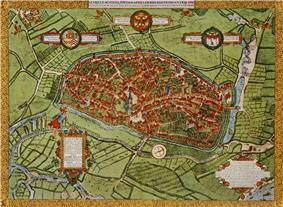 The city itself was located at the "Hellweg", an important medieval trade route, and at a ford across the River Rhine. The Romans already guarded the ford. 420 The Franks usurp the Roman settlement and recolonize the old part of the town. 883 The Normans conquer Duisburg and stay for the winter. First historic document mentioning Duisburg. Due to the town's favorable geographic position a palatinate was built and the town was soon granted the royal charter of a free city. 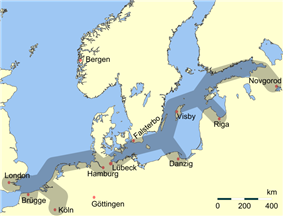 Duisburg became a member of the Hanseatic League. Around 1000 the river Rhine moved westward from the city. This put an end to the city's development as a trading town and it soon grew into a quiet rural city. The productions of cartographer Gerardus Mercator and the foundation of a university in 1655 established the city's renown as "Educated Duisburg" ("Duisburgum Doctum"). 1824 construction of the sulfuric acid factory Fr. W. Curtius. Beginning of the industry age in Duisburg. A major logistical center in the Ruhr and location of chemical, steel and iron industries, Duisburg was a primary target of Allied bombers. As such, it is considered by some historians to be the single most heavily bombed German city by the Allies during World War II, with industrial areas and residential blocks targeted by Allied incendiary bombs. In 1944 the city was again badly damaged as a total of 2,000 tons of bombs were dropped on 22 May. On 14 October, the tonnage was doubled to 2,018 tons when Halifax, Lancaster, and Mosquito bombers appeared over Duisburg as part of Operation Hurricane. This daylight raid was followed by a night attack; over 24 hours about 9,000 tons of HE and incendiaries had been dropped on Duisburg. Numerous similar attacks followed until the end of 1944. On 8 May 1945 the ADSEC Engineer Group A, led by Col. Helmer Swenholt, commanding officer of the 332nd Engineer General Service Regiment, constructed a railway bridge between Duisburg and Rheinhausen across the Rhine. This bridge was 860 meters long, and constructed in six days, fifteen hours and twenty minutes, a record time. This Bridge was named the "Victory Bridge". In 2007, evidence surfaced that linked a mosque in the city with the Hamburg cell, and also with ringleader Mohammed Atta. Also, the police uncovered calendars owned by people who attended the mosque, with the dates April 15, 2001 (the date when many hijackers slipped into the US to finalize preparations for the attacks) inscribed with 'The program begins' and September 11, 2001 inscribed with 'The program ends' in Arabic. Further investigation revealed that Guantanamo Bay inmate Mohamed Ould Slahi was a frequent visitor to the mosque, and had helped Atta recruit conspirators for the attacks. It was also believed that Ould Slahi was present in the city on September 10 discussing the attacks with other unidentified extremists. This evidence arose at around the same time as news broke of German Islamists being trained in Pakistani terrorist camps. In 2010, the city had a population of 489,600. Hence, Duisburg has seen a slight decrease in its population since 2006. Duisburg is home to 85,000 people of Turkish origin. Other estimates suggest that the Turkish population is as many as 100,000 The new Merkez Mosque, the largest Muslim place of worship in a non-Muslim country, was built with help by the way of contribution of 3.2 million euro from the EU and the state of North Rhine-Westphalia. Asiye Nur Fettahoğlu (Turkish pronunciation: [nuɾ ˈfettaˌhoːɫu]), a Turkish-German actress was born in Duisburg on November 12, 1980. "Duisport" is the largest inland port in the world. It is officially regarded as a "seaport" because seagoing river vessels go to ports in Europe, Africa and the Middle East. 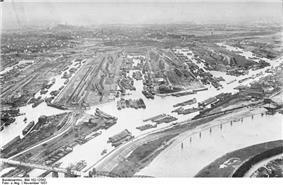 Numerous docks are mostly located at the mouth of Ruhr river where it joins the Rhine river. Duisburg is served by several Autobahns, with 3 East-West routes and 2 North-South routes. A3 forms a bypass east of the city and mostly serves through traffic. A59 runs parallel to A3 and serves the city from North to South with 14 interchanges, much more than most other cities in the Ruhr area. The A40 and A42 are two East-West routes that serve central and Northern Duisburg. Autobahn A40 also serves major through traffic from the Netherlands to Berlin and points East. A short spur, A524 serves southern Duisburg. Most Autobahns have six lanes or are upgraded to six lanes (A59). 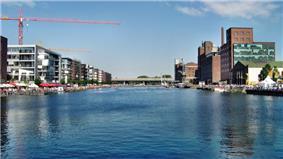 Duisburg hosts a comprehensive range of cultural facilities and events. A highlight is the annual "Duisburger Akzente" , a festival focusing on modern social, political and cultural topics. Thanks to its history as a harbor city and a trade and industrial center Duisburg offers a variety of architectural places of interest, such as the German Inland Waterways Museum. The spectrum goes from old churches such as "St Johann Baptist" in Duisburg-Hamborn, which was built in 900, to modern age buildings like Micro-Electronic-Centrum in Duisburg-Neudorf, built in 1995. Another subject of interest is the Landschaftspark Duisburg-Nord an abandoned industrial complex open to the public and an Anchor Point of ERIH, The European Route of Industrial Heritage. The city center locates the Wilhelm Lehmbruck Museum, the municipal theatre  and the shopping street known as "fountain mile". On 24 July 2010, 21 people were killed and hundreds injured in the city during the Love Parade, an electronic music procession and party. ^ "Weather Information for Duisburg". ^ Stanton, Shelby, World War II Order of Battle: An Encyclopedic Reference to U.S. Army Ground Forces from Battalion through Division, 1939-1946 (Revised Edition, 2006), Stackpole Books, p. 97. ^ Jim & Tom Peacock. "duisberg". Geocities.com. Archived from the original on 2009-10-23. Retrieved 2009-05-05. ^ "Ausländer_2006-2007_Kreise.xls" (PDF). Retrieved 2013-03-26. ^ "50 Jahre Deutsch-Türkisches Anwerbeabkommen | 50 jähriges Jubiläum zum Anwerbeabkommen der Türkei und der BRD" (in Deutsch). 50jahre.wir-sind-du.de. Retrieved 2013-03-12. ^ DÜNYA. "TGRT Haber » Haberler » Dünya » Almanya'nın en büyük camisine yoğun ilgi". Tgrthaber.com. Retrieved 2013-03-12. ^ Das ist Volkesstimme" – Thilo Sarrazin in Duisburg » xtranews - das Newsportal aus Duisburg » antonia-colloni, Duisburg, feindbild-islamkritik, hartmut-krauss-feindbild-islamkritik, Heinz Pletziger, heinz-gess, Horst Wackerbarth, Integration, islam-kritik-besprechungen, islamkritik-feindbild, Karl Janssen, kritiknetz-suddeutsche-hartmut-krauss, Lehmbruck Museum, Migration, raimund-stecker, sarrazin-duisburg, sarrazin-juden, sarrazin-zitate, Thilo Sarrazin""". Xtranews.de. Retrieved 2013-03-12. ^ "Türk Edebiyatı Avrupa’da". On5yirmi5.com. Retrieved 2013-03-12. ^ a b c d e f g "Cities Twinned with Duisburg". www.duisburg.de. Retrieved 2009-05-07. ^ a b c d e f "List of Twin Towns in the Ruhr District". © 2009 Twins2010.com. Retrieved 2009-10-28. ^ Brian Daugherty. "Portsmouth Duisburg Anglo-German Friends". Portsmouth-duisburg.tripod.com. Retrieved 2011-04-07.